Toshiba is headquartered in Minato-ku, Tokyo, Japan and has operations worldwide. It had around 141,256 employees as of 31 March 2018. ^ "Toshiba Basic Corporate Data". 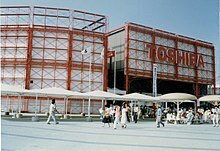 Toshiba. Retrieved 25 April 2019. ^ a b c d e "Annual Report 2012: Operational Review" (PDF). Toshiba. Retrieved 30 May 2012.